VanillaReview.com · Difference between gourmet and extract vanilla beans? Difference between gourmet and extract vanilla beans? 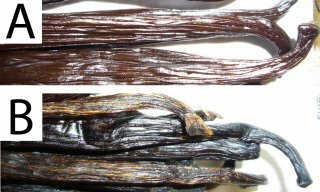 An anonymous reader asks: What is the difference between gourmet (grade A) and extract (grade B) vanilla beans? Vocabulary for describing vanilla bean quality seems to vary a bit between vendors, which can make it more difficult to know exactly what you’re getting. To cut through the confusion, this site uses the following quality labeling: vanilla beans are graded A and B.
Grade ‘A’ vanilla beans (also called gourmet or prime). These beans are oily and moist. Beans may have vanillin crystals on the outside, these will melt back into the bean if heated — crystals are not considered an indicator of quality. There are about 100 to 120 grade ‘A’ beans (6-7 inch) per pound (7.5 per oz). 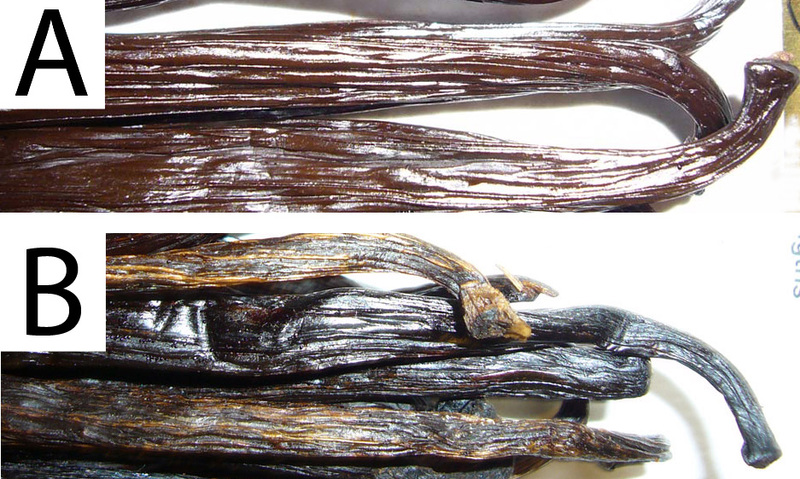 This vanilla is visually attractive so it can be a feature ingredient in gourmet cuisine. 30% – 35% moisture content. Grade ‘B’ vanilla beans (also called extract beans). This vanilla is less moist and less attractive. But don’t worry, because the flavor isn’t in the water. There are about 140 to 160 grade ‘B’ beans (6-7 inch) per pound (10 per oz). 15% – 25% moisture content. Grade A and B comparison.